God Does Not Give His Majesty to Another. Novatian (Novatian of Rome 235-258): We acknowledge, therefore, and know that he is God, the Creator of all things. He is our Lord, because of his power; our author, because of his creation. “He spoke, and all things were made. He commanded, and all things came forth.”﻿8﻿ Of him it is written, “You have made all things in wisdom.”﻿9﻿ Moses says of him, “God is in heaven above and on earth below,”﻿10﻿ and according to Isaiah, “He has measured the heavens with a span, the earth with the width of the fist”;﻿11﻿ he “looks upon the earth and makes it tremble.”﻿12﻿ He “holds the orb of the earth and those who live on it as if they were locusts”;﻿13﻿ he “weighed the mountains on scales and the groves on a balance,”﻿14﻿ by the exact precision of the divine plan. He laid out this weight of the earth’s mass with precise equipoise, lest the huge ill-balanced mass should easily fall into ruin, if they were not balanced by providential weights.﻿15﻿ It is he who says through the prophet, “I am God, and there is none beside me.”﻿16﻿ He says by means of the same prophet, “I will not give my majesty to another,”﻿17﻿ so that he might exclude all heathens and heretics with their images, proving that he is God who is not made by the hand of an artificer.﻿18﻿ Nor is he some God whom heretical ingenuity has devised. Ferreiro, A. (2003). The Twelve Prophets. Ancient Christian Commentary on Scripture OT 14. (35). Downers Grove, Ill.: InterVarsity Press. NKJ Acts 19:26 "Moreover you see and hear that not only at Ephesus, but throughout almost all Asia, this Paul has persuaded and turned away many people, saying that they are not gods which are made with hands. Just a hint, Alfred. If you're going to try to convince your audience of anything, you might start by arguing from premises you and your audience both accept. The reason you're not getting anywhere in this debate, except maybe in your own arrogant evaluation, is that we don't accept your foundational premise of sola scriptura. Many here actually did at one time--I am one of those former Protestants who once thought as you do--but we rejected the teaching for the unbiblical fallacy it is. A good number of these former Protestants even have a much better grasp of theology, the Scriptures, and basic rhetoric than you even think you have. But there are reasons we left the Protestant sects. You also still haven't given me the Bible verse that lists the 27 books of the New Testament and says these are scripture. I really want that verse. Thanks. I will, after you give me the infallible list you followed that indicated the Orthodox Church among all the churches on the planet, is the true church. Just as the list of scripture books are not in the Bible, so also your list cannot be from the Orthodox church. After all, why would you follow their list BEFORE you knew it was the true church? As I said, you are in hopeless paradox, and you are my best refutation of your argument. Many of us chose the Orthodox Church because of simple history. What church would you have chosen if you lived in the 9th century? How about the 8th century? How about anytime before the 16th century? The list to choose from was pretty narrow back then. Of course, there were multiple churches back then, but nothing compared the theological mess Sola Scriptura has gotten Christianity in. That's what happens when you invent new theology. Protestantism will die out eventually, and perhaps come back later. It happened with Arianism, Monothelitism, Doceticism, Iconoclasm, etc. You'd even have to admit that possibility, since you believe the Church founded by Christ and His apostles completely failed and had to be restored in the 16th century. The bolded words refute your argument. since we've already pointed out verses that show prophets showing veneration to men and angels. If the Bible does not contradict itself, then you must say that this verse only prohibits the worship of others than God. But it cannot prohibit veneration, otherwise you condemn Joshua for "worshiping" (in the older English use of the word) an angel. You argued sola scriptura is invalid because we don't have an infallible list of canon which NT books are scripture. You said this arguing for "sola ecclesia" "Church only" against "sola scriptura" "scripture only" as the Word of God. Well, if sola scriptura requires an infallible list of which books are scripture, then sola ecclesia requires an infallible list of which churches are God's Churches. You rejected my argument I evaluated the historical data, and chose the right books using my judgment. I sifted through the facts, to arrive at my decision for the books I believe correct. So you are inconsistent, applying a principle to me you refuse to consider sound when its applied to you. sola ecclesia is impossible because there are no infallible lists of churches. When a person refuses to consistently apply their standard, the standard is rejected as unsound. you are just misstating your beliefs because you have an agenda. The fact is, YOU make decisions about life every day, dozens of them, without infallible guidance. You don't believe this impossible to do, yet you argue its impossible I decide the canon for myself. There is nothing essentially different between choosing a church and choosing a bible book. So you also are special pleading...arguing you can't judge what is scripture when you judge everything else in your life. Your argument is specious, sophist, an elaborate misstatement of facts, to further your anti God agenda. Why is it anti God? AND of course, your alleged need for infallible list is inconsistent with historical fact...those lists didn't exist till centuries after Christ, yet He, His disciples, and the church thrived without them. Novatian isn't scripture, yet you ignored him as you do scripture, proving you have an agenda not to listen to any proofs for an opposing position. No premise is acceptable to you, if I am the one stating it. Why not admit the truth, you aren't an apologist, they must consider the merits of opposing positions to argue against them, you are a partisan. Nothing wrong with that, just be honest about it. AND stop telling me is my fault you refuse to hear. May the Lord bless you and keep you always! I protested being banned at Catholic Answers, and probably will eventually be banned here...as you gents continue to fail miserably at defending your icons. While they probably had the right idea, we won't ban you unless you begin breaking lots of rules here. These injunctions were given to the Jews on account of their proneness to idolatry. Now we, on the contrary, are no longer in leading strings. Speaking theologically, it is given to us to avoid superstitious error, to be with God in the knowledge of the truth, to worship God alone, to enjoy the fulness of His knowledge. We have passed the stage of infancy, and reached the perfection of manhood. We receive our habit of mind from God, and know what may be imaged and what may not.-Apologia of St John Damascene Against Iconoclasts, Part I.
Israel also claimed superior knowledge of God to "know what may be imaged and what may not." CSB Hosea 8:1 Put the horn to your mouth! One like an eagle comes against the house of the LORD, because they transgress My covenant and rebel against My law. 2 Israel cries out to Me: My God, we know You! 3 Israel has rejected what is good; an enemy will pursue him. 4 They have installed kings, but not through Me. They have appointed leaders, but without My approval. They make their silver and gold into idols for themselves for their own destruction. 5 Your calf-idol is rejected, Samaria. My anger burns against them. How long will they be incapable of innocence? 6 For this thing is from Israel-- a craftsman made it, and it is not God. The calf of Samaria will be smashed to bits! 7 Indeed, they sow the wind and reap the whirlwind. There is no standing grain; what sprouts fails to yield flour. Even if they did, foreigners would swallow it up. 8 Israel is swallowed up! Now they are among the nations like discarded pottery. 8:1. Like a swift eagle comes the Assyrians because Israel has rebelled against God's law including its prohibition against images. 8:2 Israel protests they know God, that they did this by God's mystical direction (cp 8:4). 2 You know that you were Gentiles, carried away to these dumb idols, however you were led. Evil spirits pretending to be God's leading carried them away into idolatry. These were confident they knew God, that superior knowledge enabled them to " avoid superstitious error, to be with God in the knowledge of the truth, to worship God alone, to enjoy the fulness of His knowledge."-Ibid. 8:4 God contradicts their claim, their religious experiences were not from Him, He had nothing to do with their apostasy from the Law. 28 So the king sought advice. Then he made two gold calves, and he said to the people, "Going to Jerusalem is too difficult for you. Israel, here is your God who brought you out of the land of Egypt." (29 He set up one in Bethel, and put the other in Dan. 30 This led to sin; the people walked in procession before one of the calves all the way to Dan. Each gold calf represented God, He was being worshiped through them. God spurns the image and asks "How long will they be incapable of purity." That God speaks of impurity rather than idolatry confirms the calf image was used to worship Him. 8:6 "For this thing is from Israel-- a craftsman made it, and it is not God." Their impurity is astonishing given the origins of this image are clearly known, a craftsman made it, not God, therefore He will smash it to pieces. Little children, keep yourselves from idols. Amen. Thanks...as for martyrdom, I suggest we all get ready for that. I practice giving the right answer, so when the time comes, I won't embarrass my LORD Jesus Christ. 12 Here is the patience of the saints; here are those who keep the commandments of God and the faith of Jesus. 13 Then I heard a voice from heaven saying to me, "Write:`Blessed are the dead who die in the Lord from now on.'" "Yes," says the Spirit, "that they may rest from their labors, and their works follow them." lol, Alfred! Your questions have all been answered many times. May God bless you. Its dark now...too late for your garden! And I was thinking ripe strawberries! NKJ Hosea 8:1 "Set the trumpet to your mouth! He shall come like an eagle against the house of the LORD, Because they have transgressed My covenant And rebelled against My law. 3 Israel has rejected the good; The enemy will pursue him. 4 "They set up kings, but not by Me; They made princes, but I did not acknowledge them. From their silver and gold They made idols for themselves-- That they might be cut off. 5 Your calf is rejected, O Samaria! My anger is aroused against them-- How long until they attain to innocence? 6 For from Israel is even this: A workman made it, and it is not God; But the calf of Samaria shall be broken to pieces. "how long until they attain to innocence" proves this wasn't outright idolatry...otherwise the prophet would say so. These Israelites had a calf image ICON with which they venerated the God of Israel, claiming their superior knowledge prevented them from committing idolatry...unlike the idol worshipers, they knew God! καὶ ἐμοσχοποίησαν ἐν ταῖς ἡμέραις ἐκείναις καὶ ἀνήγαγον θυσίαν τῷ εἰδώλῳ, καὶ εὐφραίνοντο ἐν τοῖς ἔργοις τῶν χειρῶν αὐτῶν. And they made a calf in those days and offered sacrifice unto the idol and rejoiced in the works of their own hands Acts 7:41 KJV. εἴδωλονan image (i.e. for worship), by impl. a false god (< eidos "that which is seen, form"). Btw, in the OT γλυπτὸν is the word for graven image. Ah, yes, there it is "My LORD and My God!" Enter then heartily into our apology for the making of sacred images, so that the mouths of foolish people speaking injustice may be closed. This tradition comes from the old law, not from us. Listen to God's command to Moses that he should make two cherubim wrought in metal to overshadow the propitiatory. And again, God showed the temple to Ezechiel, with its carved faces of lions, forms of palms and men from floor to ceiling. The command is truly awe-inspiring. God, who enjoins Israel not to make any graven thing, likeness or image of anything in heaven or on earth, also orders Moses to make carved cherubim. God shows the temple to Ezechiel, full of images and sculptured likenesses of lions, palms, and men. And Solomon, in conformity to the law, filled the temple with metal figures of oxen, palms, and men, and God did not reproach him for it. Now, if you wish to reproach me concerning images, you condemn God, who ordered these things to be made that they might remind us of Himself. Again, atheists mock at us concerning the Holy Cross and the worship of divine images, calling us idolators and worshippers of wooden gods. Now, if I am a worshipper of wood, as you say, I am a worshipper of many, and, if so, I should swear by many, and say, ' By the gods,'just as you at the sight of one calf said, 'These are thy gods, O Israel.' You could not maintain that Christian lips had used the expression, but the adulterous and unbelieving synagogue is wont ever to cast infamy upon the all-wise Church of Christ. Commentary.—Notice that His commandment not to make any graven thing was given to draw the people from idolatry, to which they were prone, and that the brazen serpent was an image of our Lord's suffering. Btw. on that, St. Paul following up on the worship of the icon of invisible God brings the saints into the picture. " 23If ye continue in the faith grounded and settled, and be not moved away from the hope of the gospel, which ye have heard, and which was preached to every creature which is under heaven; whereof I Paul am made a minister;24Who now rejoice in my sufferings for you, and fill up that which is behind of the afflictions of Christ in my flesh for his body's sake, which is the church"
I remember a decade ago some Protestants tried spreading a "translation" of the Bible (in actuality, a disguise of their heresy, a wolf in sheep's clothing to prey on the flock of Christ), in which they translated idol "icoane" "icon." But, when you don't have Truth on your side, you have to depend on something else. So you can't distinguish between the icon of idols and the icon of the one True God. I had thought of starting a thread on Perssonism's teaching on sola scriptura, but decided the thread "Sola Scriptura - A Diversion From the True Word of God" would be an appropriate place to taste test, to spew out as poison, Perssonism's flavor of Sola Scriptura.The Church I know, so Christ I know and Paul I know, but who are you? You shouldn't wave the veil of Moses while invoking the name of Christ like a matador. You can get hurt. For the devil did indeed invent many things against them; but thanks be to God, he could not prevail over all. For the most noble Germanicus strengthened the timidity of others by his own patience, and fought heroically with the wild beasts. For, when the proconsul sought to persuade him, and urged him to take pity upon his age, he attracted the wild beast towards himself, and provoked it, being desirous to escape all the more quickly from an unrighteous and impious world. But upon this the whole multitude, marvelling at the nobility of mind displayed by the devout and godly race of Christians, cried out, Away with the Atheists; let Polycarp be sought out!. So let-as far as the honor of Christ and His One True, Holy, Catholic, and Apostolic Church allows-conform to the image of Our Father who sends rain on the righteous and wicked alike, and in the likeness of Christ and His Apostles, let God take His vengance. I'll be addressing Mr. Persson's repeat of someone else's mistake, sola scriptura, there. Just wanted to ask, since you operate on the equation icon=idol, how exactly does one have an idol of an idol? You claim (I assUme, as you don't engage St. John's words) that SS. John and Basil erred that "' Honouring the image leads to the prototype....The image of the king is also called the king, and there are not two kings in consequence. Neither is power divided, nor is glory distributed. Just as the reigning power over us is one, so is our homage one, not many, and the honour given to the image reaches back to the original....If the image of the king is the king, the image of Christ is Christ," then what of honoring an icon of an idol, if it does not reach back to the original. And if the icon does not reach back to the original, how can it be an idol, as Hosea shows that idols can have icons? That nullfies your equation icon=idol. AssUme is crude and detracts from your messages. This is a particularly important topic so I thought it might be good if you could play this one straight...maybe. For once, I think Isa's style of argumentation has been a great asset to this thread. I really wouldn't ask him to change it that much. It is so jarring to me to see his rendition of assume that I lost his message for the moment. I would not make the suggestion if I did not think he was doing a good job of addressing the issues at hand. But I suppose I am just a prude. Whether its an image or any kind of Icon, even a stuffed animal or toy, any kind of image, form or figure if used to worship God, is prohibited. The calves in Exodus, 1 Kings and Hosea are images, but they are used to worship God as the Orthodox would an icon, God is their prototype, hence God's reaction to that use is definitely relevant to icons also having a prototype. They both cut a figure. This is clearly referring back to Hosea 8:5 & 10:5. Its irrelevant whether its an icon, image or stuffed animal. What makes an image or icon forbidden is its use in worship of the true God. Quite simply this is the end of your argument right here. Icons and sacred images are not used to worship the Trinity. They are not in place for the sake of communicating with the Trinity as some kind of medium through which we speak to God. Neither Orthodox, nor Catholic worship images of ANY kind in that manner. You do mean Trinity when you speak of the "true" God, don't you? All who venerate icons of Jesus and claim this does not contradict the prohibition against any kind of icon of God in Deut 4:16, do thereby declare Jesus is not God. Public education indoctrinated me against God, but the proofs for creationism convinced me to read the Bible. When I read it, the power of its words captured me, I knew God was speaking to me through scripture. I became a believer in Christ. Christ authorized His apostles, so I believed in them. God spoke to me through scripture. He insisted God cannot lie, that if I did precisely what God said to do, I would be saved. So I did precisely that, repenting of my evil ways, and confessing Jesus is LORD before my fellow Merchant Mariners, before the eyes of angels and men. And the preacher was right about God, He doesn't lie. He saved me then, when I believed. Very interesting answer. God spoke to you through scripture. No argument there. God does speak through Scripture. But it wasn't enough, was it? It took the interpretation of another to lead you to your belief, just as it happened to the man of Ethiopia. Alfred, that's exactly what we Orthodox do. You chose to follow the interpretation of a radio preacher. We chose to follow the interpretation of the saints throughout history who have followed what they were taught from the time of the Apostles. And it's a choice I make daily, with no regrets. The preacher informs salvation exists, he doesn't mediate salvation. I didn't follow his interpretation, after he alerted me, I read the text for myself...I only observed he was right, God doesn't lie, if you do precisely as Paul says, you will be saved, no doubt about it. Doubt stops many, but its unreasonable doubt. All who venerate icons of Jesus and claim this does not contradict the prohibition against any kind of icons of God in Deut 4:16, do thereby declare Jesus is not God. Sorry. Veneration is not worship. I venerate the memory of my dead Grandfather. I do not worship it or him or any images of him, but he was a saintly man, kind, loving and generous and worthy of veneration. You are off the message here and won't ever get back now that you've let your little duck out of the sack. Veneration and worship is not the same thing at all. Irrelevant whether its veneration or worship going to a prototype via an icon, God doesn't want either through an icon, He is a jealous God, He wants you to worship Him directly with nothing in between Him and you. Deut 4:16 doesn't have a caveat, any kind of icons of me are ok as long as they are only venerated, not worshiped...God says you saw no similitude...in other words "Don't you dare misrepresent me with an image." Too late, dear heart. It is clear in all cases in Scripture that God does not wish for us to worship anything besides himself. That is indeed clear. Nothing and no one is to take the place of the living God. But icons and sacred art does not take the place of God and all of us in that tradition are taught early on that is never to be done. So you are making noise here but not sense. Your message lacks meaning and your understanding of Scripture fails. You never did answer me about the Triune God. You deny its Jesus speaking in Deuteronomy? (He speaks for the Triune God, as the Word of God). Why does God command us to Honor/Venerate our father and mother(both of whom were created in His image)? Does this make him a Liar? Also how can one be such a literalist but gloss over the contradictions in the Bible? Question makes no sense here. Why does God command us to Honor/Venerate our father and mother(both of whom were created in His image)? DOes this make him a Liar. Also how can one be such a literalist but gloss over the contradictions in the Bible? Honoring/venerating your father and mother is not being discussed. Worshiping God via an icon or image is not honoring your father and mother, please don't confuse the two. It makes perfect sense, its Jesus throughout the OT who speaks as YHWH...He is the Word of God, don't you know that? It therefore is Jesus who says "make no manner of icons of me." Do you? It seems to me that in this case you are a tad hard of hearing. That you cannot discern the difference between worship and veneration tells me that you have a difficult time grasping the Word. So the issue is not whether or not Jesus is speaking. The real issue is how well you can hear. Again you are forced to describe something that is not real in order to say it is evil and prohibited. Honor and veneration are NOT worship!! There is no prohibition against honor and veneration. It's very specific in text and in context!! God forbade "any kind of icon" of Himself, He doesn't say they are ok if these are only venerated. God doesn't want any icons of Himself. As this is Jesus speaking, it is Jesus who says no icons of God. So if you make an icon of Jesus, you thereby deny He is God. "God forbade "any kind of icon" of Himself, He doesn't say they are ok if these are only venerated." Where is your consistency? You have said several times that God does not change and that He is not a liar. So how can you argue that no one can fashion an image of God when he in fact fashions man in his image. How is he not under your interpretation violating his own commandment and there is not the same and also one that lies? Holy Martyrs of the Armenian Genocide pray for us! you are denying Jesus is God? God doesn't want any icons of Himself used in worship. Context. You must shed the context to keep your claim alive. Icons are not used to worship God. Sacred images are not made for worship as are pagan images. Any other part of this discussion is icing on the cake. Sacred images for ALL Catholics are not worshiped. Sacred images for ALL Catholics are NEVER used to stand in the stead of the Trinity. Sacred images for ALL Catholics are never used inappropriately during liturgy, which is the most perfect form of worship....one which you are missing, I might add. You see the only way you can make any progress is to control...not only the terms of the debate...but also the text, context and meaning of Scripture as well. As long as you are allowed to control the terms you can appear to make ground or hold ground. The moment you loose control of meaning, text and context...you are finished. It is heresy that you present here and it is evil because it depends entirely upon forcing your distortions of text, context and meaning on another. This kind of perversion is your idol. You love it more than Truth. Are you saying whatever is proper for God is proper for man? That God cannot reserve for Himself rights that His creatures do not have? God images God does not mean man can image God, after He expressly says "don't do it!" No, icon appears because of the impossibility of imaging the invisible. The Scripture says, ' You have not seen, the likeness of Him.' What-wisdom in the lavr-giver. How depict the invisible ? How picture the inconceivable? How give expressoon to the limitless, the immeasurable, the invisible? How give a form to immensity? How paint immortality? How localise mystery ? It is clear that when you contemplate God, who is a pure spirit, becoming man for your sake, you will be able to clothe Him with the human form. When the Invisible One becomes visible to flesh, you may then draw a likeness of His form. When He who is a pure spirit, without form or limit, immeasurable in the boundlessness of His own nature, existing as God, takes upon Himself the form of a servant in substance and in stature, and a body of flesh, then you may draw His likeness, and show it to anyone willing to contemplate it. Depict His ineffable condescension, His virginal birth, His baptism in the Jordan, His transfiguration on Thabor, His all-powerful sufferings, His death and miracles, the proofs of His Godhead, the deeds which He worked in the flesh through divine power, His saving Cross, His Sepulchre, and resurrection, and ascent into heaven. ' Give to it all the endurance of engraving and colour. Col. 1:15, 19 He is the icon of the invisible God, the firstborn of creation...for it was the good pleasureof the Father that in Jesus all the fullness of Godhead was pleased to dwell. The icon of the invisible God, after His rising in glory, He commanded His Apostles to see Him to worship Him. Is Perssonism akin to Serapis and the Apis cult? 7 Thou shalt have none other gods before me. because it's not another god, just a beast on the earth. The Church wrote in her book, the Bible that God created man in His image and likeness, and that He emptied Himself and took the likeness of man. 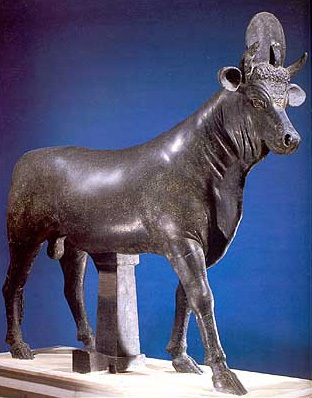 This god who serves as your prototype for calves in Exodus, I Kings (actually III Kingdoms) and Hosea must have made the bovine in his image and likeness, and taken the likeness of a calf, and is true god and true bull. Or rather false god and true bull. There is a calf in the icon of the Nativity, but that's not Christ Our God. The calf is worshipping Him. Is there any particular reason why your repeat this when I gave you the original, which you quote on the top? Your posts are too difficult for me to keep up with, so complex, quotes and replies in different places, icons everywhere. I skim over them somewhat, I am always in a hurry, but often fail to see any relevance to the discussion. There is too much clutter. If you really want my response to an argument, its best if you put that at the very top, not in a quote, so I won't miss it, then you can copy paste all that other stuff to your heart's desire...I dont read it anyway. Oh...thanks for that verse...its clear in context it refers back to 8:5, and the wording confirms the calf idol was being used as an object to worship the true God. And likewise, icons and idols are not the same. We venerate icons. We never venerate idols. From the time the Magi saw the icon of the Invisible God with Mary His mother and fell down and worshipped Him (Mat. 2:11), to the falling down in worship of the four living creatures and twenty-four elders (Rev. 5:8, 14), we have and will worship Him. Of course we agree with the statement (though Salpy can answer for herself). It seemed good to the Holy Spirit and to the Fathers to lay upon us these necessary burdens to venerate the icons and saints to worship their True God, Jesus Christ-the icon of the invisible God. Oh nonono....You don't get that twist for free!! The calf was worshiped in lieu of...in the stead of....the true God!! It was not merely an object "in the worship of" anything.
. I'm sure you don't see. LOL. Your failing to come and see is why there is this discussion. True God? 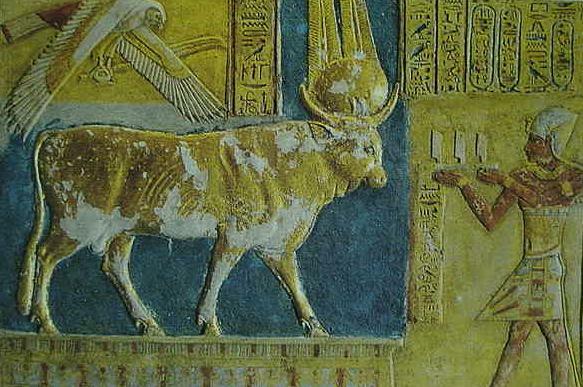 So you DO believe in the Apis bull! Yes, it seems some are having difficulty distinguishing the True God from the competition, the divine from the bovine! That's not an answer to my question. My question was: If you put a picture of Christ in your house, are you denying that Jesus is God? What you wrote above is not an answer, and I don't even know what you are talking about. I asked a "yes or no" question. So please answer yes or no. I've actually asked this question several times now, in response to your repeated insistence that making an image of Jesus means you are violating the Bible and denying the divinity of Christ. Yet at the same time, you said you would put a picture like the ones I've been pasting in your home. I've asked you if the Bible says Western pictures are not idols, while Eastern icons are. You won't respond to that. I've asked you if having the above pictures in your home violates the Bible and denies Christ's divinity. You won't reply to that. I have no choice but to believe that you have no substance behind your beliefs. You can't answer my questions. I said Jesus forbade every possible kind of icon of God in Deut 4:16. Jesus is God therefore He forbade icons of Himself. What precisely don't you understand? Of course he knows better than this, however if someone misses his sleight of hand here, then it becomes much easier to elide the clear difference between worshiping the Trinity and the veneration of sacred images, and that is the ONLY thing that gives his argument the appearance of something of interest. But it is predicated on a not so delicate fraud. Without that twist of meaning, text and context...he's through. Page created in 0.228 seconds with 25 queries.